This story is credited to Wally Lombego, a pseudonym of veteran writer J.M. DeMatteis, who had his name removed from the credits after Lucasfilm requested changes be made to the story (in short, they felt that the pro-pacifism message of the story painted the heroes in a bad light, so a line from Lando basically saying "pacifism is all well and good, but the Empire is so evil it's wrong not to fight them" was added). 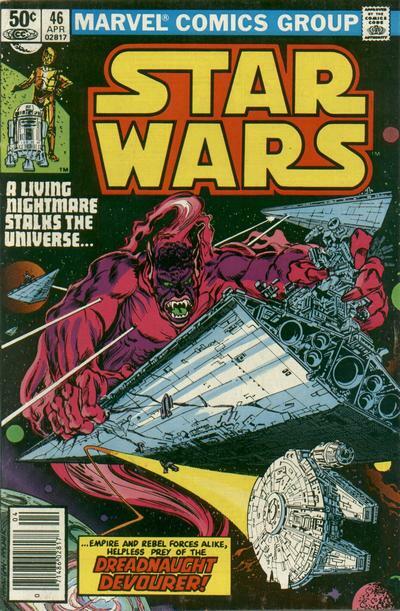 The issue begins with Lando and Chewbacca searching for Boba Fett and the carbonite-encased Han Solo. The idea that Luke and company don't know where Boba Fett and Han are at this point in time is one this series will run with, as it both opens up storytelling possibilities (like this issue, in which Lando & Chewie run afoul of something while searching) while also allowing the main characters to do something other than plan their assault on Jabba's palace that occurs in Jedi (which, of course, the series creators wouldn't know about yet). The general idea is that while everyone knows Boba Fett is taking Han to Jabba, and that Jabba is on Tatooine, they don't know when Fett's going to show up there, or where he is in the meantime. And, with presumably other bounty hunters after Fett and his prize (something the later Shadows of the Empire story will pick up on), Fett is presumably laying low and not making a beeline for Tatooine since that's where his rivals expect him to be. So the narrative device o the Rebels trying to find Han, which makes life easier for the creators, makes some sense in-universe as well. On the other hand, Luke specifically tells Lando he'll meet him on Tatooine, making it seem like that's where Lando & Chewie are heading to when they fly off at the end of Empire. Which puts the creators of a series intended to tell continuing adventures of these characters in a bind, so it's understandable that they fudge that apparent setup a bit, but it's still another example of the series dancing around some of the stickier continuity points the movie left for it. This is the first appearance of Cody Sunn-Childe, an early fighter against the Empire who received nearly godlike powers and in the process pledged himself to pacifism. Though this is his only direct appearance to date, he does get mentioned in later reference material, and thus technically was part of the old Expanded Universe. The antagonist of this story is Imperial Captain Plikk, notable for being the first female Imperial captain we've seen. The Statement of Ownership in this issue lists the average number of copies of each issue sold over the previous twelve months to be 256, 605, with the issues closest to filing date selling 227,005 copies. As a point of comparison, the Statement of Ownership numbers from Uncanny X-Men in this same month (issue #144) are 192,514 and 205,736. While not yet the sales juggernaut it would eventually become, X-Men was still doing quite well for itself, and is only a couple years away from becoming a franchise with the launch of New Mutants, yet Star Wars is outselling it. Tom Palmer, who previously inked issues #8-10, returns to ink Carmine Infantino this issue; he'll return with issue #49 to begin a long stint as the series regular inker. A narrative caption describes Lando as being new to the Rebel cause, and while it makes sense in hindsight, having seen him leading the Rebels during the Battle of Endor in Jedi, it's actually something of a leap for the series at the time of publication, as there's no guarantee the roguish Lando would formally fall-in with the Rebels, even while he's dedicated to searching for Han. Lando mentions that he was enamored with Sunn-Childe's battles against the Empire as a boy; later stories, both in the old Expanded Universe and the current canon, establish that open rebellion to the Empire didn't start until well after Lando reached adulthood. Also, the later EU would establish that the Empire, one notable exception, who worked in secret, aside, didn't generally promote women to captain, the result of sexism within the Imperial military structure. The current canon is rolling that idea back a little, with at least one prominent female officer operating in the open during the height of the Empire. 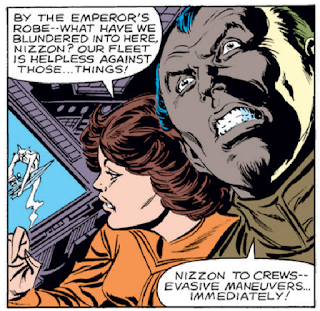 Throughout this issue, "warp" is used synonymous with lightspeed and hyperspace. Captain Plikk uses "by the Emperor's robes!" as a curse, taking advantage of the Emperor's brief appearance in Empire. 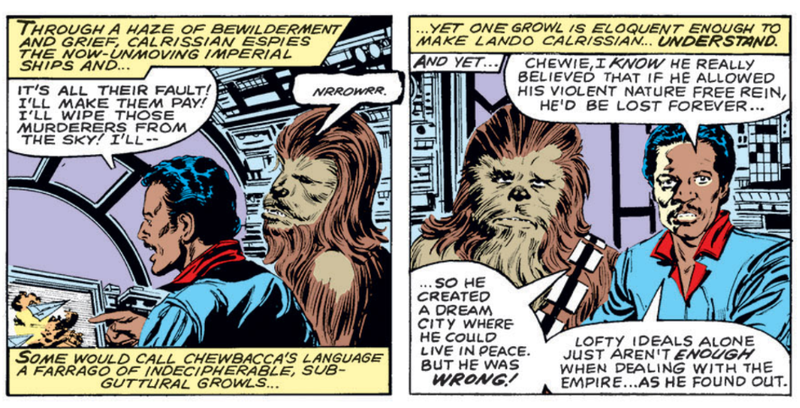 Chewbacca, getting in on the ground floor of pop culture decades in advance. As opposed to earlier letters criticizing it, this issue features several writers praising "Riders in the Void" from issue #38, specifically requesting more art from the Golden/Austin team. "The message of the story was that there is as much nobility in laying down your arms - dying for a dream of peace - as there is raising your hands in violence. [Lucasfilm] said 'it makes our characters look bad to have other characters that won't fight, and to say that it's a noble thing not to fight.' That was incredible to me. I said, 'Forget it, I'm not putting my name on this.' I couldn't have my name on a story that I dedicated to my son (named Cody, not coincidentally) and was supposed to be about these very deep, passionate beliefs that I have." Putting aside this issue's merits (or lack thereof) relative to its status as an Empire Strikes Back followup (in that it uses the search for Han as a starting point and features Lando, but otherwise exists independent of anything from the film), it's actually not bad. 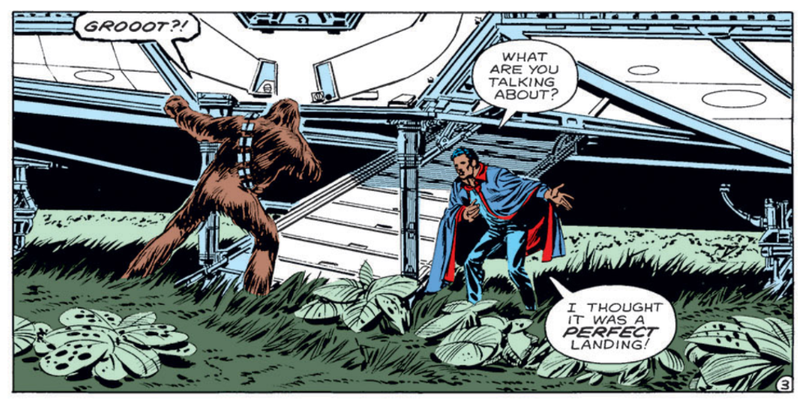 While I can appreciate DeMatteis' ire over the changes wrought on his story, Lando's one face-saving (in the eyes of Lucasfilm) line of dialogue really doesn't take away from the message all that much, and the intended larger point still stands at the end despite it (for all of the concern on both sides, I take it more as an expression of Lando's perspective on pacifism, not the series as a whole). The arrival of Tom Palmer on inks, who helps reign in some of Infantino's more outlandish and overly stylized tendencies, also serves the story well, putting a touch of realism into it in contrast to Sunn-Childe's outlandish powers. As the first check-in on Lando & Chewbacca post-Empire, this is disappointing, but as a standalone story, it effectively uses the trappings of Star Wars to tell an entertaining story with a unique, thought-provoking idea at its core. The story felt rather Star Trek to me. I figured it had to be a pseudonym — just based on the oddity of the name itself (sorry, any real-life Wally Lombegos out there) and me not being familiar with it. Upon looking the issue up in the GCD, even before I got to your post, who he really was made perfect sense. 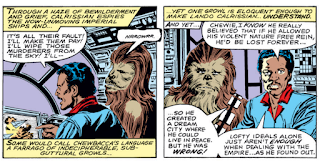 Those panels from the last page you used, by the way, cement my suspicion that Wookies must communicate their intent telepathically as they growl. And someone who, like most of the original characters we’ve seen in the series, wears a more traditional — in comics, anyway; certainly Infantino-drawn comics — futuristic/outer-space outfit, skintight and boldly colored rather than utilitarian. Ditto Sunn-Childe. While I didn’t go back to look at those earlier issues to see if the same holds true for them, I wonder if Palmer was brought in here to (and/or if whomever inked this would’ve been asked to) keep the established characters more on-model in the wake of Empire, like you suggest — even though Luke still looked very Infantino last issue, as you surmised that might have been from inventory to some degree. 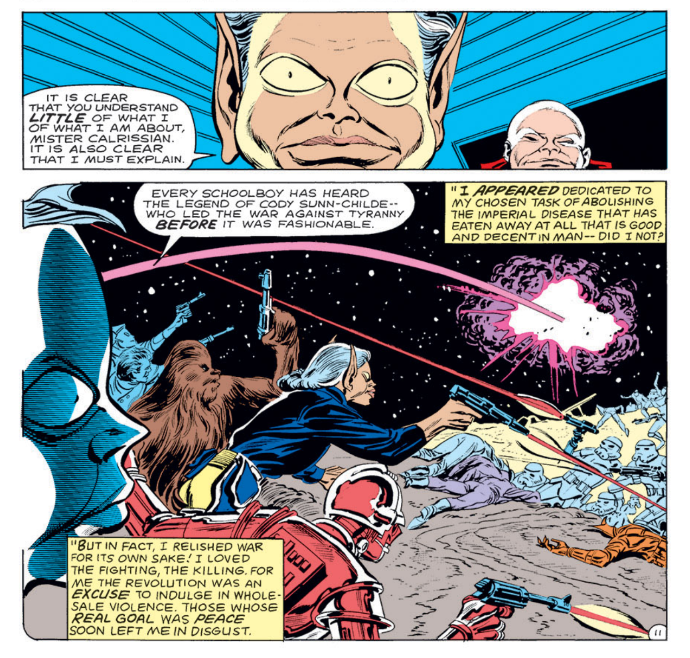 The phrase “space-normal speed” is also used in a dialogue caption as the Imperial ships enter the dimensional rift, which is a term I associate with Star Trek. DeMatteis has my sympathies but, um, the series isn’t called Star Passive Nonviolence.